When people think of gas street lamps in Boston, they tend to think of Beacon Hill. But in the pre-electric light bulb era (and even for some time after that) gas street lamps could be found throughout Boston and its neighborhoods. Most of these gas street lamps were removed during the changeover to electric street lights, but a few have survived to the present day. You'll generally find them in unusual places: for example, a fire access path on Jones Hill in Dorchester has one and alleys and short streets designated "private ways" are other good places to look. Wellesley Park in Dorchester has gas lamps on both sides of the park, lending charm to one of the city's most remarkable hidden neighborhoods. 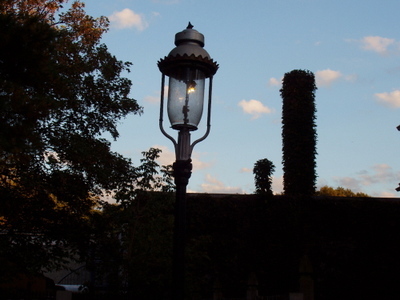 Some of the gas street lamps of Jamaica Plain have been identified, with pictures available here. Others throughout the city are undocumented, but well loved and prized by neighborhood residents. The one in this picture illuminates a path leading off of Union Avenue in Jamaica Plain to a house tucked in back of two houses facing Union Avenue. The lamp now sits on private property and has been adopted by the current owners of the property. If the photograph above makes you think of another image, you're probably thinking of Rene Magritte's L'Empire des Lumieres (Empire of Light) which can be viewed at the Guggeheim Museum in New York City. Do you know of a hidden gas street lamp in Boston? Email me the details. Visit the City Record and Boston News-Letter Store. I love these lamps and I stumble across them in JP from time to time. They are the ones documented in the other website that you referenced. Please let me know if any other gas lamps are discovered in Jamaica Plain; I'll add them to the web site. I do a periodic re-inventory to make sure the "known" JP gas lamps are still there. The one at Paul Gore Terrace was recently moved across the street to make way for new construction. It was certianly nice to see the one at Union Ave. get repaired rather than removed when a new house went up there. There are two more flanking the entrance to the Boston Police K-9 unit on Allendale Road. There are also several of this Boulevard-type lamp hidden in the alleys of the Mission Hill Triangle between Huntington Ave. and Tremont St. on the flat of Mission Hill, and a few more up the hill off of Calumet Street.